If you've never gone Para-sailing before, Boracay is the perfect place to try it - with the breathtaking view of the island, the wonderful warm breeze and the accommodating crew to assist you, you will surely enjoy the experience. We sure did! Excited to fly Para-sailing style for the first time! Speeding to the Para-sailing station! 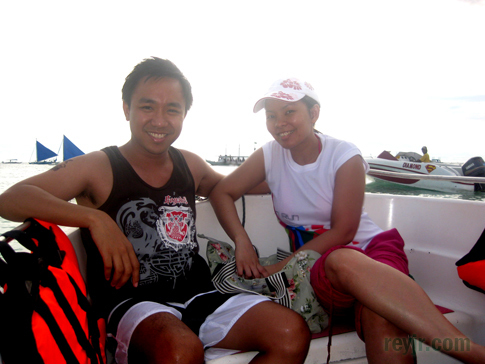 They assured us of the safety and reliability of their equipment and so we went with Diamond Watersports Boracay Island. Their pickup point was over at Station 1. When we got there, they registered our names, we paid the bill and then they radioed for the speedboat to pick us up. The boat ride up was quite exciting as well, we were cheering for the driver on to go faster, we were flying over the waves! Haha! When you get to the offshore station, you will then transfer to another bigger boat where the Parasailing gear are in place. You again register your names with them. After that, they will assist you in putting on the harnesses and the built-in life vest for safety. You should always check it yourself - look for loose connections and torn harnesses. Better safe than sorry eh? Our Superman ParaSailing chute picks up the wind quickly. There was space for 3 people to go at one time, but since there's only two of us, we were given the 2 seats on either end. Once we were seated and the hooks and harnesses were in place, we launched - the wind quickly picked up the chute and we were flying! Getting ready to Parasail. Last minute checks on the lines and hooks! We were slowly floating up, surprisingly not as scary as I imagined it to be. I was expecting it to be somewhat like one of those extreme sports and was actually preparing for a thrill ride. Far from that - it was actually quite relaxing - like being rocked in a cradle. Off into the sunset we flew! As we went higher, I allowed myself to relax, loosening my death grip on the harness and reached out to hold Liz's hand. HHWP: Holding Hands While ParaSailing! How high does Parasailing go? ﻿I must say, I was quite surprised at how high we went - probably as high as a low rise condominium. Looking straight down into the turquoise water was exhilarating, and the occasional gust of wind had both of us in stitches laughing at ourselves nervously. Lol! But for the most part it was peaceful - with just the sound of the wind, the cool breeze, and the beautiful view of the Boracay beach. I wish I brought my camera! The landing was smooth. They pulled us in and down into the water first before pulling us back into the boat. Our soft (and wet) Para-Landing.